Anaheim has excellent travel and transport connections, owing to the close proximity of Los Angeles and the benefits that come with being near such a large city, while nearby John Wayne Airport provides even greater convenience and travel options. Interstate 5 offers eventual road access from both airports as well as from northern USA, while a string of interstate highways nearby Anaheim flow in from other points around the country. Both Amtrak trains and Greyhound Lines buses have extensive travel networks that connect LA and Anaheim, while Anaheim's own transport system is modern and efficient. Los Angeles International Airport is one of the world's busiest air transport hubs and receives numerous flights and carriers from around the world. Some of the bigger hotels in Anaheim offer free shuttle transfers from the airport, while those on a tight budget can catch the AirportBus to Anaheim and major hotels. The bus travels every hour between 06.00 and 00:00, with a journey time of about 45 minutes. Taxi fares from Anaheim to LAX are quite expensive. For further information, please refer to the Los Angeles International Airport (LAX) travel page. John Wayne / Orange County Airport also serves Anaheim and the Orange County area with domestic flights from numerous US cities. Although LAX is on the right side of the city for transfers to Anaheim, if you can find a good deal to John Wayne Airport, it is a more convenient transport option. AirportBus travels from John Wayne Airport to Anaheim and major hotels every hour from 09:30 to 18:30, with a journey time of around 20 minutes. For further information, please refer to the John Wayne / Orange County Airport (SNA) travel page. Both LAX and SNA airports have major car-rental transport offices and the route from LAX to Anaheim goes via I-105 east and I-5 south to Anaheim, while highway 55 and I-5 take you to Anaheim from John Wayne Airport. Anaheim is also well connected with the rest of the US via the I-5, which travels the length of the country from Seattle in the north to San Diego in the south. 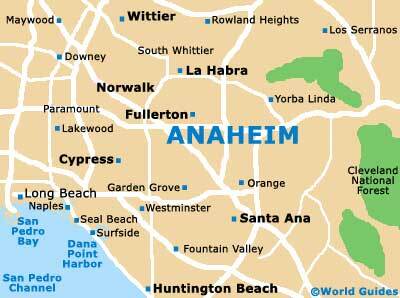 Farther afield, I-10 approaches Anaheim from Florida and I-70 from the northeast and the Eastern Seaboard. Book your Los Angeles Car Rental here. Book your John Wayne Airport Car Rental here. If you are arriving from a distant US city, traveling by bus is the cheapest, yet most uncomfortable method of transport for reaching Anaheim. You can reach Los Angeles via Greyhound Lines buses from anywhere in the country and then catch a connecting bus to Anaheim. Greyhound Lines also have several daily departures, which travel from San Diego to Anaheim. Getting to Anaheim from anywhere else in the US is fairly straightforward as Los Angeles is connected by rail with just about every major city in the US. Trains travel directly to Anaheim from LA's Union Station. Amtrak's Sunset Limited runs from Florida to LA via Alabama, Mississippi, Louisiana, Texas, New Mexico and Arizona, while the stylish Coast Starlight travels from Seattle to Los Angeles along a scenic route. To travel to Anaheim from LA's Union Station, you can board a Metrolink commuter train. Anaheim's in-house transportation options include the ART's 10 electric buses, 25 propane-driven trolleys and two electric trams, which travel to and from Anaheim's attractions, hotels, restaurants and shops. 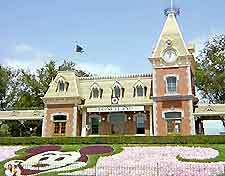 Multi-day passes and multiple routes that cover all important areas of the city, including the Convention Center and Disneyland, are available. Taxis travel from both airports to Anaheim, with the John Wayne Airport Yellow Cab Service being a reliable choice from SNA. Expect to pay a hefty sum from LAX to Anaheim as it is a long way and there is a surcharge from the airport. 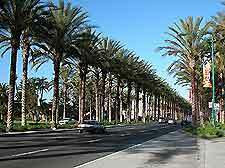 With the excellent trolley system in Anaheim, there is no need to travel by taxi within the city.